ResNet professionals work hand-in-hand with residence life, housing, and student affairs professionals. These professions share common histories, traditions, and professional and personal cultures. Learning about these professions and their cultures, particularly their specific histories and relationships with technology, will make your work easier, more efficient, and more effective. Attendees will learn how to interact with, collaborate with, and better understand these non-IT professionals. The program was relatively well-attended and it seemed to go pretty well.Â I left a lot of time for questions and discussion and the amount of time I left seemed just right.Â I could tell that some of the attendees were a bit bored but I know that this topic isn’t one that speaks to all of the ResNet Symposium attendees, particularly those who are more focused on technical issues such as network management. But it’s important and often overlooked. The second event on Monday was the Town Hall Meeting.Â Dee Childs stepped down as President and handed over her duties to Sheila Crowe.Â A few other positions were shuffled around before I was handed the floor to give a brief plug for the RARG, the symposium’s research arm.Â Afterward, the meeting was devoted to discussing the future of the symposium with questions and comments being taken from the floor.Â I had hoped this would be an expansive discussion but the entire conversation focused on whether or not there should be a membership fee.Â I really didn’t understand or follow the discussion, particularly as it seemed to go round in circles with no firm conclusion or consensus. 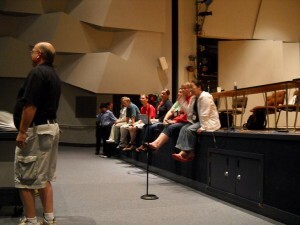 The proposed “membership fee” seems to be an ill-defined solution in search of a problem. The remainder of the symposium was dedicated to the vendor fair, t-shirt exchange, and closing ceremony/dinner.Â They all went over very well and were enjoyable. I wonder about the longevity of this organization and its annual event.Â Attendance was down significantly this year and while that is probably largely reflective of the economy I don’t see that (the lower attendance or the economy) changing in the next year or two.Â Moreover, now that many of the bigger challenges of residential computer networking have been solved (standards are more developed, equipment is more prevalent and standardized, successful support models are in place and easily copied and modified, etc.) I’m not sure that the event as it exists has enough to offer attendees, particularly newcomers.Â Much of the draw seems to be based on friendship and community, conditions that are difficult to advertise and extend to those who have not attended multiple times and become familiar with those involved in the event.Â I believe that the ResNet Symposium must shift or widen its focus, perhaps taking as its purview a broader view of student technology support and student supervision, if it is to remain relevant and viable. 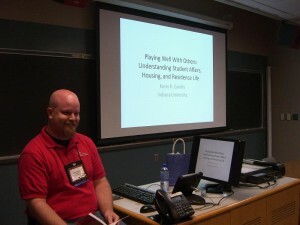 A few weeks ago I attended and presented at the 2009 ResNet Symposium. Held at St. Cloud State University in Saint Cloud, Minnesota from June 26 through June 30, the symposium was smaller than in previous years with only 134 registered attendees. However, the programs, activities, and interaction were all wonderful, interesting, and useful so the lower number of attendees didn’t seem to significantly hurt or change the nature of the conference. I took detailed notes for most of the sessions I attended but I feel that too much time has passed for me to write detailed descriptions of each session.Â I like to do that right away to help me reflect on what I learned.Â But this time around I made more of an effort to socialize, network, and enjoy time with my colleagues and friends so I spent more of my time doing that and less time on my computer engaged in solitary activity.Â Of course, having my own presentation on the last day of the conference and spending time each night to continue preparing for it also significantly impinged on the amount of time available for reflection and writing. As I become more experienced and professionally mature, I find my interests and ideas changing.Â Those changing interests led me to pay more attention this year to trying to ascertain the maturity of the programs and services represented at this year’s conference.Â In particular, I was interested in seeing (a) the maturity of the assessment activities carried out by ResNet programs and (b) the levels of strategic planning and how well those plans are integrated with other plans (campus-wide, divisional, etc. 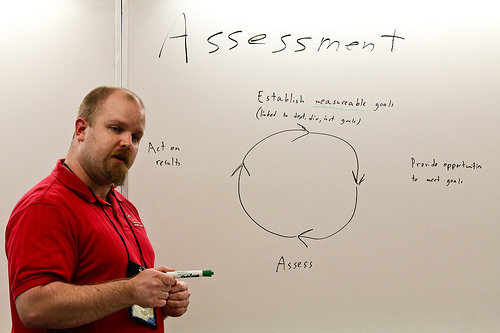 ).Â In general, it seems that even the most mature of the programs represented at this conference are still in a relatively early stage of performing assessment as they are still heavily rooted in measuring opinion and input/output (number and type of computers, number and frequency of computer lab logins, amount of bandwidth consumed, etc. ).Â Learning outcomes seems to have not penetrated to many of these programs, perhaps because many seem to see themselves primarily as service centers with minor auxiliary educational responsibilities.Â On the strategic planning side, it’s hard to gauge the level of depth and integration of these programs’ plans given the focus of many of these programs and the interests of the participants. Paul Glenn, Computer World columnist and author of How to Manage and Lead People Who Deliver Technology presented the keynote address at 9:00 a.m. on Saturday. His talk focused on explaining how “geeks” are different from other people and how to lead geeks in an organization. I’ve become a complete academic snob so I didn’t really enjoy this talk as the depth of his research was very shallow. Luckily, much of what he said is relatively close to what the real research says (yes, there is actual research into the social and cultural phenomenon of “geeks” … and “nerds”). If you’re interested in learning more about Glenn’s thoughts about leading geeks, he maintains a website at leadinggeeks.com. Beth McCullough, Learning Spaces Manager for Stanford’s Academic Computing group, led a practical discussion of learning space concerns. 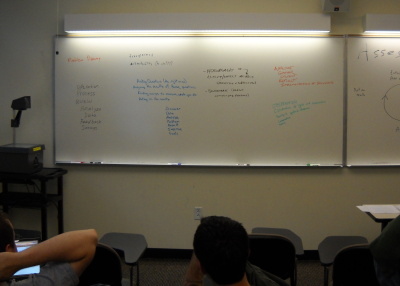 Much of her discussion focused on her attempts to maintain and rehabilitate computer labs in Stanford residence halls. I greatly liked how much of her presentation and the decisions she has made are tied to data collected from and about Stanford residents as too often we make decisions in a void (see above regarding the current state of assessment in most ResNet shops). The most interesting discussion related to working with housing professionals in understanding and trying to reconceptualize how they understand (and use and fund and label and maintain and…) study spaces that happen to have computers. The second session I attended was presented by my good friend from Northern Illinois University, Jan Gerenstein. Jan is an Associate Director in their housing department and a former colleague in the ResNet Applied Research Group (RARG). She discussed with us how her group – Residential Technology – is participating in and integrating themselves into their division’s strategic planning process. This was a very interesting session for me as I strongly suspect that it would have been very different if Jan’s group were housed in a technology division instead of student affairs. Based on several years of observation, the cultural differences between these two groups – ResNet operations housed in central IT vs. those in housing – are clear (a topic that was the basis for my own program at this year’s ResNet Symposium and a potential program for NASPA’s 2010 conference). But I wonder if the different planning and assessment skills and emphases and driving these two groups farther away in terms of their goals and services. The reason why we ask about the program’s parent group (central IT, housing, etc.) on the ResNet surveys is because we – or at least I – strongly believe this to be one of the key lens through which we can and should examine and understand residential computing. I didn’t take very many notes during this session. Karen McRitchie of Grinnell College did a great job with this program but I struggle mightily with programs that seem to arbitrarily lump together so many people and draw conclusions about those people from limited and flawed data (is my bias and academic snobbery showing?). During my darkest, bleakest moments in these sessions, I want to bludgeon Howe and Strauss with their own book. Karen was very complimentary of the students with whom she works and I was very happy that this was explicitly not a session that bemoaned the fate of the world today with Generation X taking the helm. I was most interested in this session as it closely mirrors so many (so many!) programs at student affairs conferences I’ve attended. Judi Renni from Tufts and Loriann Higashi from Yale are ResNet old timers and they presented a wonderfully entertaining and informative session describing their latest efforts at getting students interested in and aware of better security practices. Unlike most ResNet Symposium programs, this one was not videotaped; the presenters showed us several videos that made fair use of copyrighted material and they (and their lawyers) didn’t want those videos to be recorded and distributed. Judi and Lori also took advantage of the privacy offered their session by sharing with us frank (but not disrespectful, disparaging, or unprofessional!) evaluations of their entire processes from start to finish. We very much appreciated their honesty, particularly when they were brave enough to share with us their challenges and failures. Some of the Tufts materials can be viewed online as can the Yale materials. 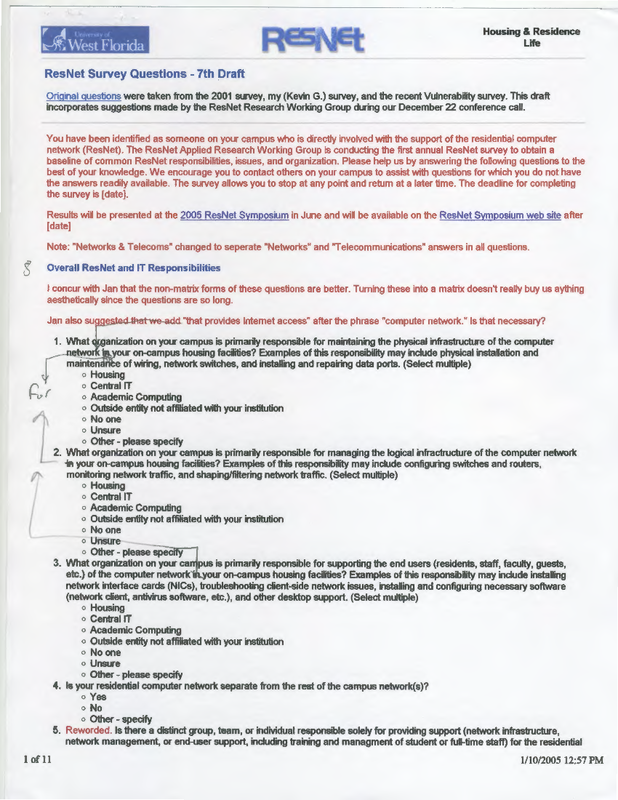 Earlier this year, the ResNet Applied Research Group solicited participation in the 2008 ResNet Survey. 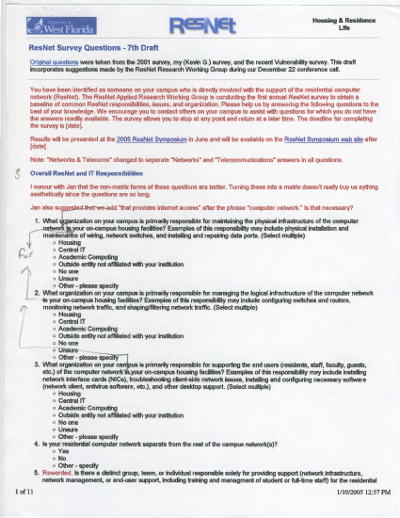 This comprehensive survey focused on residential technology support groups, their responsibilities in supporting technologies to residential students, the service issues they addressed, and their organizational structure. Over 100 institutions participated and we are pleased to inform you that we have publicly released data from the survey at http://resnetsymposium.org/wiki/index.php/RARG:2008_ResNet_Survey. We are profoundly grateful to those who participated and we look forward to answering any questions you may have as we continue this and related research. It’s taken us quite a bit longer to release these results that we hoped and anticipated. We’re a tiny (3-person) volunteer group so when life and work call it’s easy for our research projects to become lower priorities. And we have other things going on, too, within the group. Despite releasing data from most of the survey, we still have some work to do with the open-ended questions. Making sense of that data is more involved than tossing data into SPSS and running some calculations. We’ve done some of that work but have more to do. In July, those of us interested in technology issues related to higher education were whipped into a frenzy by an amendment to the Higher Education Act proposed by Sen. Reid (D-NV) that would have put a spotlight on institutions that receive lots of notices alleging online copyright infringement by students and required them to adopt technological measures to reduce infringement. Many in higher education opposed this amendment and Reid dropped it rather quickly. Shortly thereafter, the Senate passed their version of the Higher Education Act. Now it’s the House’s turn to introduce their bills to renew the Higher Education Act. Yesterday, House Republicans unveiled their version of the House bill. It’s a 409 page document but we’ll only concentrate on our narrow, niche interest of technology affecting students. Have developed a plan for implementing a technology-based deterrent to prevent the illegal downloading or peer-to-peer distribution of intellectual property. This section of the Republican’s bill is almost word-for-word identical to Reid’s amendment. As I see it, the primary difference between this bill and Reid’s proposed amendment are that (a) this section is part of a much larger bill, potentially making it more difficult to focus on or repudiate, (b) the bill is proposed by Republicans, the minority party, whereas Reid;s amendment was proposed by the Senate Majority Leader (and thus a Democrat), and (c) this is a House bill and the House has been much more sympathetic to copyright holders and very unsympathetic to concerns of colleges and universities. Terry W. Hartle, senior vice president for government and public affairs at the American Council on Education, is quoted by Inside Higher Ed as saying: â€œIronically, as drafted the legislation would wrap institutions in an amazing amount of new federal red tape and, at the same time, order the Secretary of Education to study ways to reduce overregulation.” Contradictory political and financial demands are neither new nor unexpected but they take on additional significance when the political demands are of unproven and dubious effectiveness. We can be sure that this portion of the bill, if passed, would increase costs and likely decrease freedom for students on campus but we have no assurances that the required technical means will have any lasting or significant effect on reducing copyright infringement or effecting a change in the ethics, actions, or beliefs of students. As demanded and rewarded by our current electoral system, these legislators are overlooking or ignoring the long-term view in favor of the short-term view that favors financial gain. Many sections include amendments to include or require electronically-distributed information and resources. I am also slightly amused that several sections of this bill specifically focus on the Department of Education’s College Online Opportunities Locater (COOL) online tool. Not only do many of the recommendations seem to be micromanagerial and overly specific for a federal law but the tool itself was recently revamped and relaunched as “College Navigator.” This is another fine example of the speed with which technologies and technological tools change. Update: EDUCAUSE has posted some talking points (Word document) for those who wish to contact their representatives and urge them to oppose this bill.